Vorshlag has been setting up many different cars for track use for a very long time. Along the way we have learned a thing or two about the capabilities of OEM braking systems. 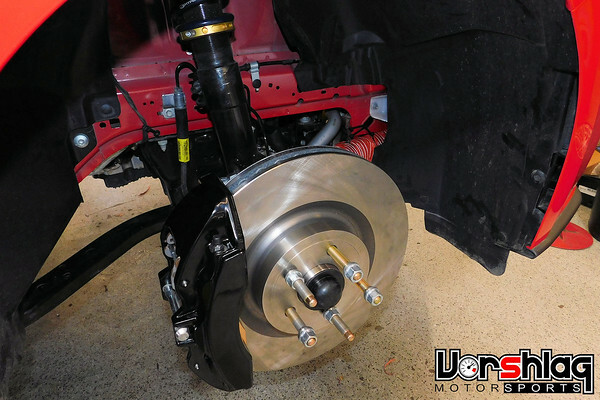 For our shop S550 chassis, we started with a base model 14" 4 piston brakes. These rotors are built "backwards" and there is no way to push any cooling air through them. So we quickly upgraded to the optional "Performance Pack" 15" 6 piston Brembo brakes. This is the minimum we recommend for these heavy S550 car, which have a powerful V8 and some serious speed potential. 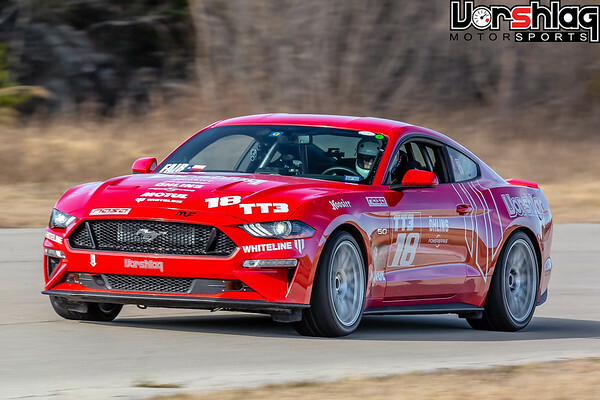 At tracks like NOLA and COTA we see 145+ mph speeds into heavy braking zones. That heat has to go somewhere, and that's where brake cooling comes in. 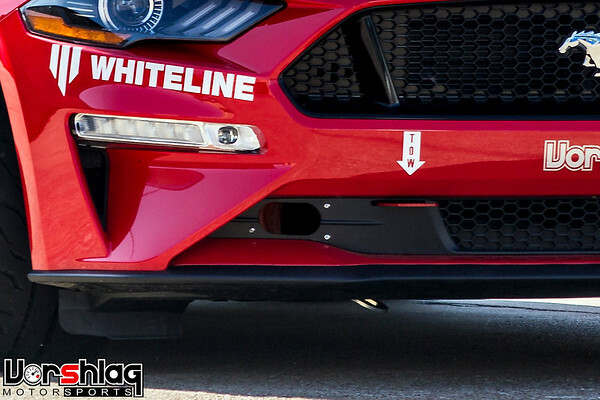 We like to take a high pressure stream of air from the front of the car (see optional inlet ducts, shown below), run this air through some ducting or hose, and force it into the back of the front brake rotors. This pushes a high volume of air around the front wheel bearing (extending its life) and through the vented cooling vanes of the rotor, which sheds this brake heat out through the rotor like a pump. Our solution involves this stainless steel backing plate that has a 4" oval duct located "under" the rotor face. This backing plate also serves as a heat shield for the two ball joints that make up the lower control arm as well as the steering rack tie rod. 304L stainless material makes for a great heat shield. The face of the rotor is uncovered beyond a tiny radial portion that helps seal the backing plate to the rotor, which maximizes cooling flow where you want it. 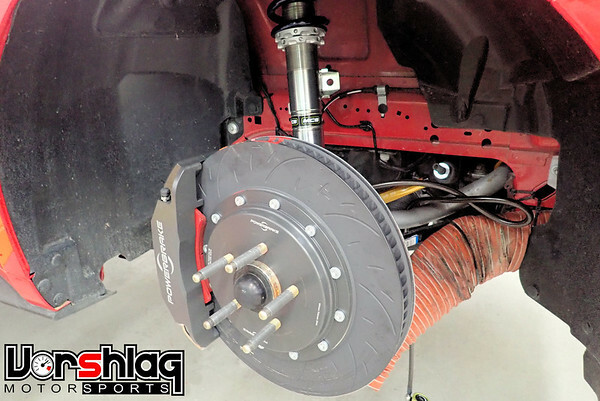 Vorshlag has tested this 4" S550 backing plate kit onto our own car with both the 15" PP brakes as well as the Motorsports grade 380x34mm Powerbrake 6 piston kit (see above). Tight fit to rotor face to limit air bleeding off the rotor. Oval ducting hole is almost completely inside inside rotor hat resulting in more effective cooling. Fits inside common 4" brake cooling hose without modification (optional). Brake Ducting Hose: For duct hose we only use the best, this is not some hardware store dryer hose. We use silicone double wall tubing that allows the best possible air flow and is super durable. This option includes 4 clamps and two 4-foot section of high quality brake duct hose that will properly fit over the Vorshlag Brake Duct Backing Plates.